The first document supports the view that the human microbiome, being a specific part of a human being, belongs to the individual and therefore should not be subject to any obligations under the EU regulation 511/2014, related to the Convention on Biological Diversity (CBD) and the Nagoya Protocol. Accordingly, States cannot assert sovereign rights over the microbiomes of their citizens. The second document expresses the concern on the proposal to let the Digital Sequence Information fall under the regulations of the CBD and the Nagoya Protocol. It states that barriers to sharing and use of DSI would discourage innovation and scientific research and consequently the advancement of science. Regulatory authorities are therefore asked to recognize the continued and ready access of DSI for advancing R&D. LABIP has signed both documents, in line with the discussions at the above mentioned workshop. In June this year, Salvettia and coworkers (*) published the result of a whole genome sequence analysis of 269 species, primarily belonging to the 25 families of the Lactobacillaceae and the Leuconostocaceae. Not surprisingly, the results showed a tree in which phylogeny and taxonomy were in serious disagreement. In order to solve this confusing situation, a considerable renaming at genus level might be necessary. The current genus Lactobacillus (containing over 200 species) is therefore in risk of being renamed and split into at least 10 new genera. While very defendable from a scientific point of view, practical implications are far reaching, given the fact that many lactobacilli are involved in food fermentations and therefore have a legal status in relation to their use, functionality and safety (labelling, ingredient status, QPS status, GRAS notification, etc…). Name changes could also have consequences for the medical community, as new names may only slowly penetrate into medical laboratories. In order to make an inventory of the possible consequences and discuss the different options to deal with this extensive renaming, LABIP has composed an impressive international panel of experts, representing Academia and Industry. October 4 and 5 these stakeholders have discussed the pros, cons and possible consequences and make some recommendations for a smooth ‘taxonomic transition’. The workshop was attended by 35 participants, 14 experts and 21 LABIP representatives. While taxonomic renaming’s have been quite frequent in the past, the scale at which this is going to happen for microorganisms with such a great importance in food and health, is unprecedented. A link to the hand-out, comprising the program, the abstracts and the names of all participants will be find hereunder. The official result of the workshop will be made available on our website as a formal publication. The full presentations will be available at our Intranet. 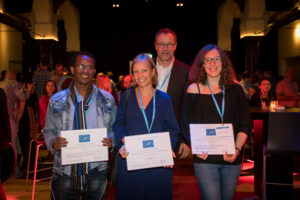 At the LAB Symposium 12, held from August 27 till 31 at Egmond aan Zee, The Netherlands, for the fifth time the LABIP awards for the Mid Career Senior Scientist and for the best 3 posters have been presented by the LABIP Chairman Esben Laulund. Also for the third time LABIP has organized a thematic session at the LAB Symposium. The prize of 2500 € for the Mid Career Senior Scientist has been given to Prof. Sarah Lebeer from University of Antwerp, Belgium for the research she has don one Bacteria-host interaction for beneficial microbes and probiotics, specifically Lactobacillus rhamnosus GG. The LABIP Steering Group considers her research to be completely in line with the criteria of “Outstanding Excellence in Lactic Acid Bacteria Research with an Industrial Relevance”. In her research she has used the full spectrum of modern molecular approaches, while she also has also worked together with a top chef developing cooking techniques to bring in new bacteria into foods. 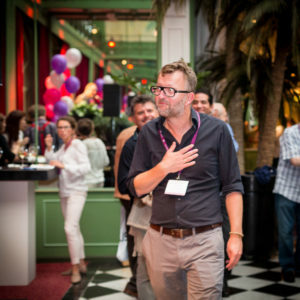 Eric Johansen, Chr. Hansen A/S, Horsholm, Denmark: Is the development of new starter cultures caught between a rock and a hard place? The presentations during the Thematic Session were well appreciated by the more than 450 participants of the LAB12 Symposium. May 10 and 11 2017 an expert workshop has been organised aiming at the implementation of new natural and genetic selection methods for industrial starter cultures and the influence of legislation which is being implemented as a consequence of the Nagoya Protocol. This protocol from 2014 is now ratified by almost 100 countries, including the EU and establishes the compliance to Access and Benefit-Sharing (ABS) rules of the countries. These rules have been implemented after the Convention of Biological Diversity of 1993. In the workshop, the potential of the new genetic approaches for LAB was depicted, including examples of what has been achieved during the latest years. On the other hand it was made clear that the legislation, following the Nagoya protocol and which is still under debate, will have an enormous influence on academic and industrial research. The outcome of the workshop will be in the form of a position paper, which will be written in the coming months and published. The Hand-out, containing program of the workshop, the list of participants and the abstracts of the presentations, as well as the complete presentations of all expert speakers can be found in the Members Only section of the website. At the LAB Symposium 11, held from August 31st till September 4th 2014 at Egmond aan Zee, The Netherlands, for the fourth time the LABIP awards for the Mid Career Senior Scientist and for the best 3 posters have been presented by the LABIP Chairman Esben Laulund. 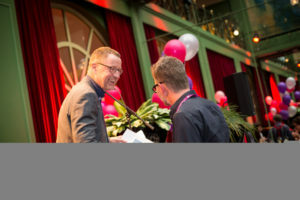 The prize of 2000 € for the Mid Career Senior Scientist has been given to Prof. Bas Teusink for the way he is moving the field by the application of bioinformatics and systems biology, needed to handle big data in the field of metabolomics and analysis of complex microbial communities. These approaches will also become more and more relevant for industrial application of these fields. The ITN Cross-Talk has organized its final Symposium in Paris on September 3-4 2012 entitled “The Disruption of the War Metaphor of Human-Microbe Interactions in the Gastrointestinal Tract”. With this meeting a highly interesting EU financed project has ended, in which LABIP was an associated partner. LABIP has played a key role in the training programme of the ITN. By our contribution we have ensured that the requirements for career development in industry and the possibilities for research in industry have been covered. Our activities have given the 17 research fellows an insight in the opportunities for a (research) career in industry, while the LABIP members had the possibility to interact with a group of high quality young scientists in the area of the human gut – microbiota interactions, as well to follow the latest results in this fascinating area of research, so relevant for the food industry. At this final Symposium, Aat Ledeboer has given, on behalf of LABIP, the last 2 prizes of 300 € each for the best oral presentation and best poster. The poster award was given to Frank Duca, a PhD student from INRA, Joy-en-Josas, entitled “Replication of obesity and associated signalling pathways through gut microbiota transfer”. The price was given for the very convincing way it was presented as well as for the intriguing research results. 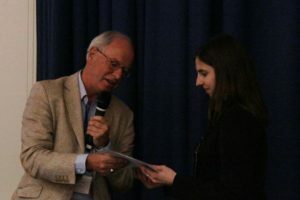 The award for the best oral presentation was given to the Cross-Talk fellow Agata Korecka, who is doing her PhD at the Karolinski Univeristy in Sweden. From 12 to 16 September 2011 the third Network Meeting of the ITN Cross-Talk has been held in Wageningen, The Netherlands. The first 2 days consisted of scientific presentations on the interaction of the gut microbiota and the host with among others short presentations of all fellows on their research and chaired by one of the other fellows. This formula led to a highly interactive meeting with a lot of scientific debate among the fellows and their supervisors. During the last 3 days the third and final Summerschool was held, organized by LABIP. At the first day the group of 16 fellows visited the Dutch Dairy Institute, NIZO in Ede, where they listened to peresentations of young NIZO scientists and where 3 of the fellows presented on their research in Cross-Talk. After a short tour through the building and the pilot plant and a lunch, the group went to the Yakult factory in Almere. The fellows clearly were impressed by the high quality standards of the factory and also by the scientific presentations. Back in Wageningen they were given a traditional Dutch pancake meal. The second day of Summerschool a Career Perspectives Workshop was given by professional trainers. Also LABIP members were involved during the job interviews. The fellows considered this to be very valuable for their career development especially since most of them now are at the end of their PhD period. The last day of Summerschool focused on health claims, the role of EFSA was discussed. 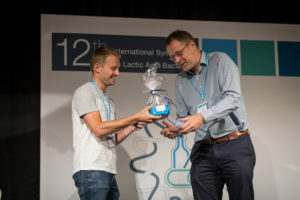 During the Tenth Symposium on Lactic Acid Bacteria, held from August 28 till September 1 2011 in Egmond aan Zee, The Netherlands, LABIP has offered for the third time&nbsp;an award of 2000 € for the Mid-Career Senior Scientist and 3 awards of 500 € for the best posters. 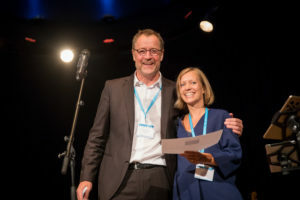 The awards were presented by the LABIP Chairman Esben Laulund and all are based on outstanding excellence in LAB research with industrial relevance. 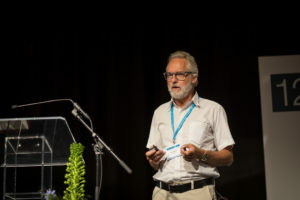 The award for the Mid-Career Senior Scientist was given to Sylvain Moineau, University of Laval, Canada, on his longstanding research on LAB bacteriophages and specifically for his recent outstanding and innovative research, together with researchers from Danisco, on the CRISPR/Cas bacterial immune system against bacteriophages. Sylvain joins herewith the winners from 2005 and 2008, Michiel Kleerebezem and Joel Doré. Damien Dandoy, UCL, Louvain la Neuve, Belgium entitled “Conversion from slow to fast milk acidification through natural transfer of the cell-envelope proteinase prtS gene in S. thermophilus strains”. 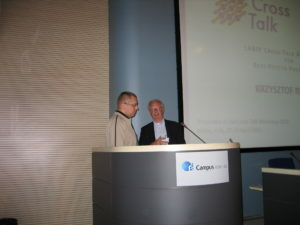 LABIP has given 2 prizes of 300 € each for the best oral presentation and best poster at the Cross-Talk workshop “Lessons from Host-Pathogens Interactions” held in Milan, Italy April 28-29, 2011. The poster prize was given to the Cross-Talk fellow Krzysztof Regulski on “The influence of peptidoglycan metabolism in L. casei on its immunomodulatory properties”. The prize was given as well for the quality of the poster, its content and on the excellent, convincing way it was presented. 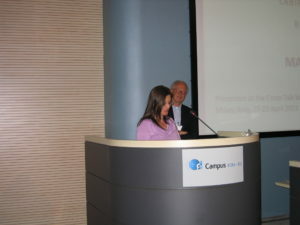 The oral presentation prize was given to Mariangela Cavarelli, a young postdoc from the San Raffaele Scientific Institute in Milan who was invited to present on “Dendritic cells mediate the selective transmission of R5 human immunodeficiency virus (HIV)-1 through the intestinal mucosa”. This prize was given for the excellent way it was presented, its contents and the excellent slides.